Just what were Alan Davis’ plans for Captain Britain in 1991? | The Captain Britain fans' page and blog. Just what were Alan Davis’ plans for Captain Britain in 1991? If you speak to Captain Britain fans about his time in Excalibur nearly all will agree that the title was at its best when Alan Davis took over the book. 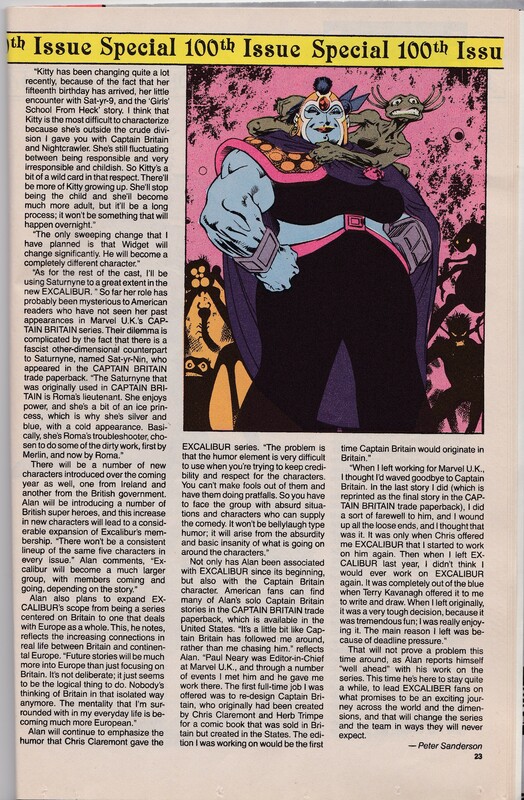 With that in mind today I’m going to bring you an Alan Davis interview from 1991 when he was cornered by Marvel Age magazine before his run on Excalibur started, and where he spoke about his hopes for the book and Captain Britain. The article starts after the cover shot below, you can either read the scanned pages or following them I have picked out some points of interest, so you can get the get the feel of the interview if you cannot read the scans. 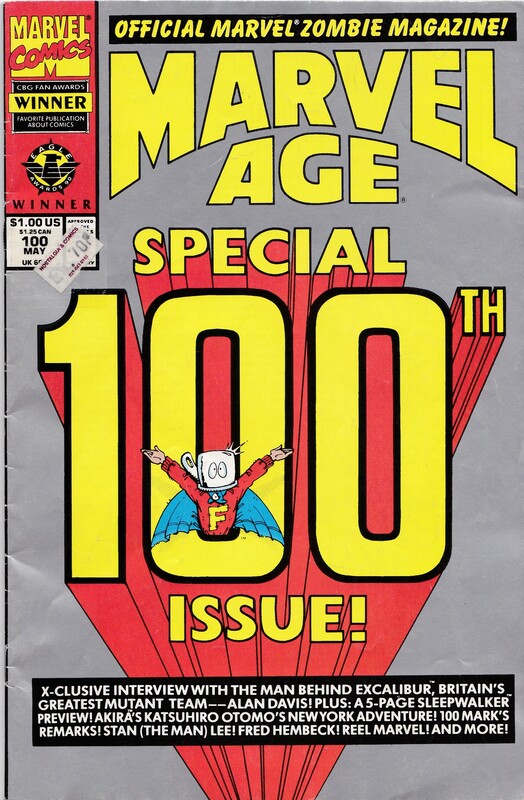 Yes at one point in time Marvel did allow their comics to reach issue 100 and not reboot them, anyway here’s the interview. The interview starts with a potted history of Davis’ involvement with Excalibur before promising us “an ambitious new story line that will reveal the true purpose behind the origins of the team.” High stakes indeed what were Davis views? “Editor Terry Kavanagh has asked me to wind up some of the loose ends and make resolutions to certain character developments.” A fair comment, as recent issues of Excalibur prior to Davis’ take over had to me become a bit of a continuity nightmare and full of “funny” stories which certainly didn’t lead to any character development, and often where far from being kind to the team. Marvel editorial were I’m certain probably well aware of this, and while no note is made of dwindling sales I can’t help but feel handing the title over to Davis might have been a kill or cure editorial choice. Luckily they chose well, but back to the interview. Excalibur and Captain Britain foes Gatecrasher’s Technet were due to return and Davis describes them brilliantly: “They’re basically pretty useless and incompetent: getting into situations where, because of their own clumsiness and lack of planning things fall apart.. ” A true definition of the Technet certainly, and those who read Davis’ Excalibur run will certainly remember he shook them up, and gave them a temporary new leader. Davis when asked about the plot replies: ” It’s all very complex, I’ve got myself a flowchart of where everyone’s going to be at different points, in different dimensions.” Looking back this was certainly reflected in Davis’ writing, never where there issues as throw away as recent Excalibur stories had been up to his coming on board, but never where the stories so convoluted that like other X titles fans might feel lost. Let’s take a look at how Davis planned to handle Captain Britain: ” Although he’s an intellectual Captain Britain’s very quick-tempered and slightly arrogant in his own knowledge”. Plot wise Davis stated “Basically our Captain Britain is a rogue. He’s not done what he’s told.. he’s let his side down and he’ll be in for some penalties.” Davis played his cards close to his chest here as he wrote in Cap’s cursed blunder factor that had made him as he was, and how it’s removal bought forward a more stable person who was no longer a buffoon, but a fully fledged hero confident in his power and aware of his responsibilities. Alan signs off with how his career and drawing and writing Cap’s have seemingly become entwined. “When I left working for Marvel UK I thought I’d waved goodbye to Captain Britain… it was only when Chris – Claremont – offered me Excalibur that I started to work on him again. Then when I left last year I didn’t think I would ever work on Excalibur again. It was completely out of the blue when Terry Kavanagh offered it to me to write and draw. Alan Davis Modern Masters part one. Alan Davis Modern Masters part two. Alan Davis Modern Masters part three. Alan Davis scripted Excalibur 42 to 67 and his whole story has been collected in three trades, if you haven’t read it yet it’s highly recommended with its massive story lines, great art and offbeat sense of humor. 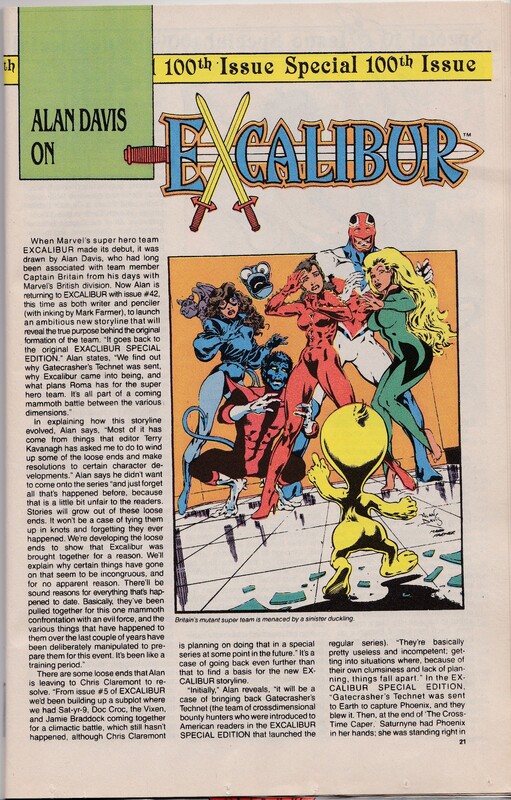 This entry was posted in Excalibur, Marvel UK, Modern Masters Alan Davis and tagged Alan Davis, Captain Britain, excalibur, interview, marvel Age, Terry Kavanagh by Richard. Bookmark the permalink. 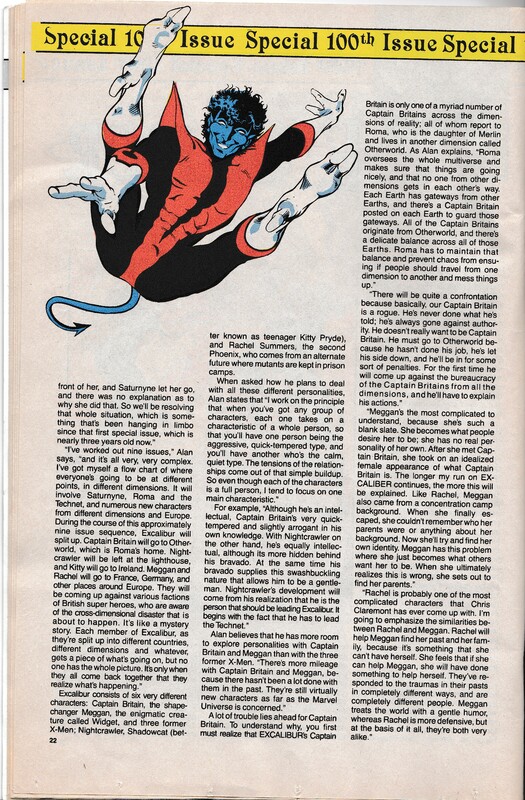 Although I tend to blame American writers (especially Chris Claremont) for Captain Britain becoming a horrible caricature of the hero he used to be, the interview does remind me that Alan Davis himself did tend to push Brian further towards the “angry and arrogant” version of the character than I’m comfortable with. Though in Davis’ Excalibur CB is a much better balanced character than Claremont’s, even post blunder-factor he’s more of a macho hot-head than he ever was in his own series. I love Brian as a slightly flawed hero (I find perfect heroes unbelievable and unbearable), but the ultra-macho stuff is a turn-off; under Thorpe and Moore he wasn’t like that, and for most of Delano and Davis’ run CB was great, especially the more irritated he got! But even in Davis’ Excalibur he still is a little too aggressive, too unthinking. Conversely I found Cornell’s Captain Britain too blandly heroic, so I guess some people are never pleased! At least I have my Captain Britain omnibus to look at when I want to remember how good the character can be. Where is Alan Davis now, when Captain Britain really needs him to correct the horrible characterisation done to him by bad writers such as Paul Cornell, Jonathan Hickman and Scott Lobdell? I’d give anything to see Alan come back and have Cap and his entourage written and drawn properly again. Alan is on Captain Britain and the Mighty Defenders by Al Ewing, which while I’m sure will be good it won’t hit that sweet spit as if he was on our Cap again. Maybe he’s not interested and is Captain Britained out?